Hello, I’m Sophia from Tattooed Tealady! Weaning has been an incredible journey for us and so I am really excited to share our story with you today. We’re just a small family of three here; there’s me, my partner of 5 years and our little girl Willow, who is 16 months old. We live in a quiet part of a busy town in the East Midlands and spend our days playing, reading and exploring. We made the decision to do baby led weaning whilst I was pregnant, practically as soon as we found out about it and started researching it for ourselves. For our family, it seemed logical to follow the baby led weaning route as not only are we a very baby led family in general, but we decided that the positives of baby led weaning far outweighed any nerves we may have had about starting weaning, which in itself can be both an exciting and nerve wracking time! We started baby led weaning on Willow’s 6 month ‘birthday’. We wanted to wait until the age recommended by both the NHS and WHO and so we patiently waited for the 6 month mark to roll around. We were never tempted to start before the 6 month mark, we knew that she was fine on milk alone until then (and arguably, until she was 1 as food before 1 is ‘just for fun’!) and we knew any ‘signs’ of interest in food were just normal baby behaviour; watching us eat or grabbing food (which she never really did, to be honest!) didn’t mean she needed food before 6 months. I did a lot of research in the months leading up to starting baby led weaning; information provided by the NHS and WHO, information from our Health Visitors, reading a few studies and a couple of baby led weaning websites. We also picked up the Baby Led Weaning Cookbook by Gill Rapley, which I found had more than enough information on how to get started and how to change things up as each month goes by in terms of size of food, what foods to introduce when and most importantly for us, I found the information on foods common with allergic reactions and how to test for these, to be absolutely essential for us, as otherwise, I never would have considered those specific foods being something we would need to introduce slowly and individually. When it came to actually started we decided to really go for it, offering 3 meals a day. For us, that worked wonderfully, and Willow was eating properly (rather than the tasting/smelling/mushing we’re told to expect for the first 4-6 weeks) within 3 or so weeks, which is great! Willow seems to love everything we give her, she doesn’t turn her nose up at anything and even loves brussel sprouts! She can be a little picky with meat, preferring softer textures like mince, but seems to be eating more chicken and pork since her back teeth came through. She will literally eat anything and everything! Her favourite meals seem to be scrambled eggs on toast for breakfast, sandwiches at lunch, and anything with mince for dinner so spaghetti bolognese, cottage pie etc. Also, fruit! Everyday she eats fruit, as snacks and for dessert. Little fruit monster! We are yet to try her with anything that she refuses to eat or seems to dislike, which I think we have been really lucky with – I hope things continue this way! When we’re out and about, we tend to take a few snacks with us like bananas, blueberries, raisins and a snack pack like Organix or Kiddlyicious wafers and puffs. We did start buying Willow her own meals from kids menus, but so many of them concentrate on fried foods and so we just share our meals with Willow instead. Only one pub/restuarant in our town has a kids menu which has a healthy option, so it can be quite difficult to find somewhere that doesn’t just sell chicken nuggets and chips! If we’re not going anywhere specific where we’d be sat down for a meal, I make a little pack up for her; usually a sandwich, some fruit and a snack. We use the Cosatto Noodle Supa Highchair in the super food and foody themed design, Chopsticks! 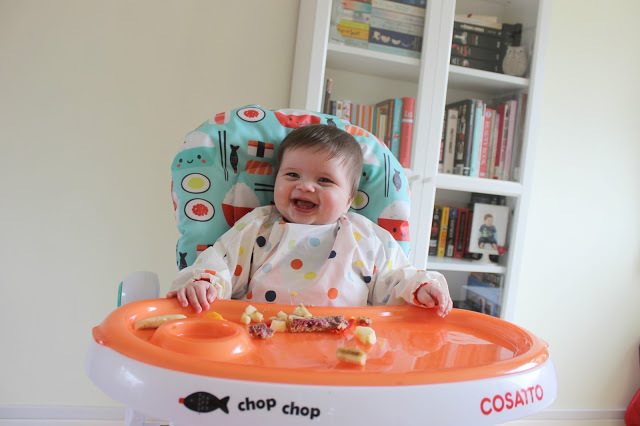 I actually did a thorough review on my blog, but I would wholeheartedly recommend it to anyone looking to buy a highchair. I love that you can alter the height, recline it, the tray is easy to take on and off and it’s so effortless to clean and incredibly sturdy. I like to cook everything from scratch but if we’re having a cheeky takeaway then I have no issues with Willow trying things. If we do have takeaways though, she will always have her own healthy dinner and just try something of ours; I’d never give her an entire meal from a takeaway as I think the salt, sugar and fat levels in takeaway food is just totally unnecessary for little ones. Same goes for fast food venues like McDonald’s; I’d rather give Willow something homemade, that I know is healthy and good for her, than get her into bad habits of wanting junk food. We have been so lucky that our weaning journey has been a very smooth and easy one. There have been no instances where we have felt overwhelmed, unsure what to do or questioned our weaning choices. I know we have been super lucky that Willow loves food so much and is willing to try anything we give her! The only criticism we have received about our weaning choices, has been, ironically, from other bloggers. When I shared our choice to start baby led weaning over on my blog, a few early weaners took offence and there were a good few months of abuse thrown around and negative comments made about Willow doing baby led weaning. Other than a select few people, everyone else – both online and offline -, has been hugely supportive and whenever we have friends or family over to eat, or we go out to eat, we are complimented on how well Willow eats. 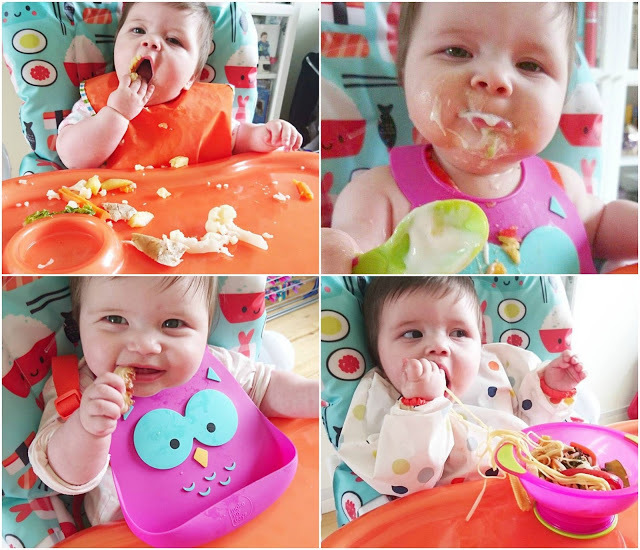 We’ve even had people contact us to say that sharing Willow’s baby led weaning journey, particularly on Instagram, has made them feel relaxed about starting weaning themselves and given them confidence in doing baby led weaning, which I think is just amazing! I do meal plan, mainly to save money on our monthly food bill and also because I am trying to lose weight, so I find it easier to plan ahead. We don’t always stick to the meal plan, and for Willow it’s not really important for her to stick to a specific meal plan as I can rustle up whatever I feel like making at the time. Financially though, I think meal planning can be invaluable, especially if you are on a tight budget! Our highchair is definitely our most invaluable piece of weaning equipment. We also love Munchkin bottles with straws for giving her water, and the Nuby and Vital Baby ranges are fab for bowls, plates, spoons etc. Bibs are a must-have and we have tried our fair share. At first we tried the ones with the full sleeves, but found them such a faff to clean up. 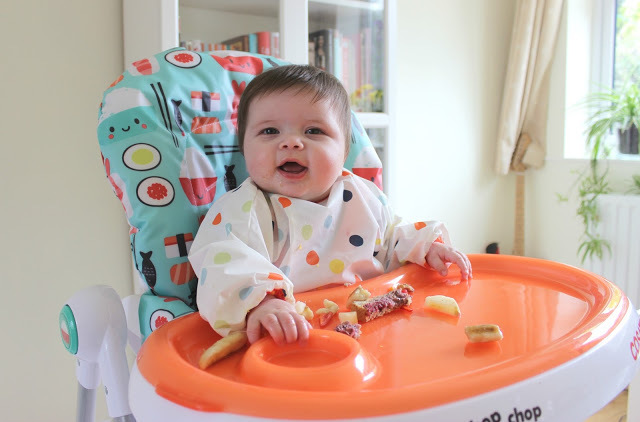 Now we stick to fabric bibs that we can just stick in the washing machine after using – thankfully, weaning hasn’t been too messy for us and Willow tends to just eat her food really well rather than making a mess or throwing anything around. If we were to do it all again, I don’t think we would do anything differently. The way we have gone about weaning has worked wonderfully for our family and most importantly, for Willow. I am 100% behind baby led weaning (although totally believe it is up to each family to decide what is best for them) and would definitely follow the same route if we had another baby. My advice to new mums, and dads, about to start weaning, is to trust your instincts, do your research and go with what works best for you. Every baby is different, so how your baby reacts to food and weaning in general could be a world apart from how another baby reacts. It’s not a quick process, it takes time and patience and trial and error, but it’s a journey you should be excited to start; your baby is learning to eat, exploring textures and tastes and smells. Soak up the journey with them and enjoy it! Big thanks to Nicola for having me over on her blog today. It’s been super fun writing about our weaning journey to share with you all! If you want to keep up to date with our life, you can find me at www.tattooedtealady.com and @TattooedTealady across social media. Great choice of highchair – we so nearly went for that one. Love the Cosatto range!